Jack Finlay from Pilling Care Home is shown how to use the computer by volunteer Natalie Danson. Elderly residents at a nursing home in Over Wyre are using today’s state-of-the art modern technology to open a door on the past. Using the Simply Unite computer system – and the help of local school children – people living at Pilling Care Home are able to keep in touch with family who live far away and can bring back memories of their younger years thanks to the magic of YouTube. Funding from the Get Connected grant has meant the home is the first in Over Wyre to benefit from the new hi-tech system, helping dementia patients in their later years. Justine Gaunt-Nelson, HR and office manager at the home, said: “It is absolutely fantastic. “It opens up a whole new world to the residents. They can receive emails, photos and videos. They can keep in touch family – some residents have family who live far away, in Australia or New Zealand. “If there is a family event like a wedding, a birth or a party our residents can’t go to, then family can take photos or video and send it via the computer for them to see. “They can have Skype conversations with relatives who live far away and get to see their face while they are talking. “And it’s a great memory aid too. We can look on Google and find YouTube video of things like Vera Lynn singing to the troops. We can use Google maps to find the area they used to live in, or grew up in and take a look at the street and how it is now. “It is fantastic for reminiscing and can help to access memories. “We will be holding an open day on August 9 for families to come in and see how the system works and then hopefully they will be able to take full advantage. 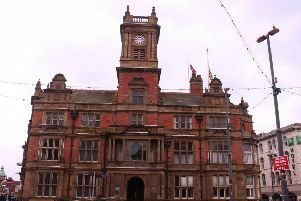 And as a way to build bridges between the generations, pupils from nearby Fleetwood’s Charity School have been paying regular visits to the home to help the residents use the computers. Matron Sandra Connelly said: “The residents faces just light up when the youngsters come in. The Simply Unite system is just brilliant. Headteacher at Fleetwood’s Charity School, John Belshire, said: “It’s great from the children’s point of view, as they get to hear older people’s interesting life stories and experiences. Pupil Francesca Abbotts, 11, said: “It’s really good we are able to come to the home and it’s really nice because sometimes the older people’s families live far away. And Jack Finlay, an 89-year-old resident at the home, said he had used the new technology to regularly email his daughter Beatrice and also contact other family across the UK, including his native Scotland. He said: “I think it is an amazing opportunity to be able to use this system. “You can look at photos and videos. During the war I served in Africa and I could use the computer to look at the area I served in.